No wedding is complete without a theme – and for a theme to work you have to get your decorations, attire, invitations, flowers, and everything else just right. While most people conjure up images of rustic, harsh images around fall – nothing could be further from the truth. There are plenty of soft shades of red, brown, orange, and yellow that works beautifully for a big autumn wedding. Autumn has a warmth about it that no other season does, and you can use the beautiful colours and natural foliage to create a truly magical day. When it comes to choosing flowers it’s important to choose those that are in season to ensure your theme is perfect – not just for the colours, though that is a major plus. In season flowers are more affordable and you’re guaranteed to have the freshest flowers possible. Autumn weddings commonly take place outdoors, so bear this in mind when you make your plans – don’t feel restricted by flowers, though, you can also incorporate the plant life you see around you. If you choose the right outdoor wedding spot you will have plenty of local plant life to take advantage of to help create a stunning scene. No autumn wedding would be complete without pumpkins – why not lean into the season by going all the way with a Halloween themed wedding. Now, no one is saying you need to dress up as Elvis to exchange your vows, but if you’re interested in having a unique wedding day that everyone is sure to remember then a Halloween wedding is the way to go. 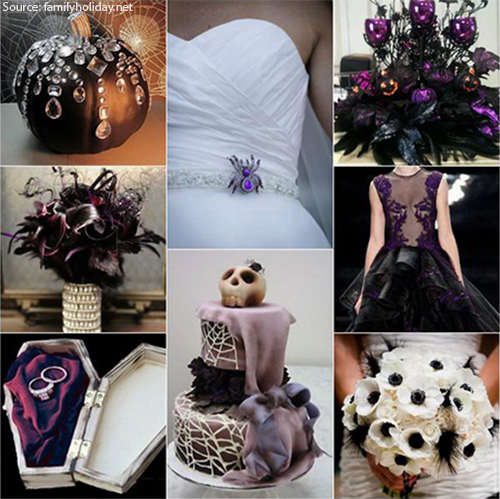 You can invite guests to dress along with a chosen theme or simply ask them to stick to Halloween colours. It provides you with an exciting opportunity to get creative with your food choices, cake, and creepy cocktails, too. Of course, if you do want to go down the costume route – you can go big! Smoking cauldrons, creepy crawlies, gruesome snacks, and more – if you and your partner are a truly unique couple then you deserve a wedding that reflects who you are. Imagine it – an evening wedding with dimly lit locations, bespoke suits, and sumptuous dresses. The flair of the forties could easily make your wedding day a perfect one – something straight out of a black and white film. Visit Van Heusen to check out some of the best ever suits collection suitable for any occason. This theme rests in lush fabrics, tones that are rich, deep, and opulent decorations. You can add romance and light with candles littering every available surface (bonus points if you use candelabras to do so. Forget signature cocktails – this is the perfect opportunity to reignite everyone’s love for whiskey – include a roast dinner, a delectable chocolate dessert and you have the perfect day. You can do a lot with pine needles, so think buttonholes, and don’t be afraid to choose red bridesmaids dresses. This is a chance to really go for it, in terms of luxury and let’s be honest, your friends definitely aren’t planning a flying forties autumn wedding so you will definitely be able to pull off a truly unique wedding day. Go big or go home – the season brings large flowers to life, with shades of rusty red and bright purple there is a lot you can do with centerpieces and bouquets. 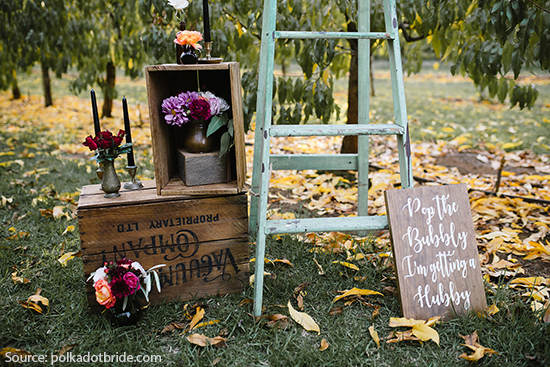 Why not embrace the season by holding your wedding outdoors (in an orchard or create the look)? Autumn has become a popular wedding season just because it welcomes a chance to do things a bit more casually. So, if you don’t want a big meringue dress and you would feel more comfortable in a sleek, lacey number, available at Cue, an autumn orchard wedding is ideal. Men always look dapper with ankle length trousers, braces, and a nice shirt – you can accessorize them any way you like – choosing casual shoes or dressing them up a bit with a nice pair of loafers. This type of theme also means you don’t need to worry as much about your food choices – no one will judge you for serving apple turnovers – and who cares if they do? This is all about your big day and this is the perfect way to celebrate your love. When it comes to autumn food options – don’t be afraid to embrace rustic – the undecorated cake, casserole dishes of food – it doesn’t have to be pretty, it’s beauty lies in its warmth and deliciousness. Wedding planning is an expensive business, so it’s always important to take the deals and discounts that come your way when you can – you would be surprised at just how much money you can save when you look to take advantage of coupon codes.